PIANO CHORDS are 2 or more notes played at the same time. A triad is 3 notes played together in a chord. A major chord has the 1st, 3rd, and 5th notes of the scale. It has the root, the major 3rd, and perfect 5th tones of the scale. There are major, minor, diminished, and augmented chords. These are the main piano chords on the keyboard. The C major chord has C as the root, E as the 3rd note, and G as the 5th note. The MAJOR CHORD is 1, 3, and 5. Note that you can play this with the 1, 3, and 5 fingers of your hand. In the key of C major you can use all the white keys stacked in thirds to find out what chords are major or minor in the key of C.
From C to E is two whole steps. From C to E is a major 3rd interval. Remember that a major 3rd interval has 2 whole steps and you can find any major 3rd interval. A major chord has a major third interval between the 1st and 3rd notes of the chord. A major chord has a minor third interval between the 3rd and 5th notes of the chord. 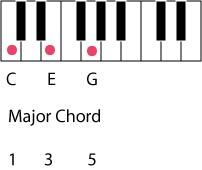 A MAJOR CHORD always has two intervals - A MAJOR 3RD FROM THE ROOT and then A MINOR 3RD from the 3rd to the 5th. The C major chord has C as the root, E as the 3rd note, and G as the 5th note of the chord. From C to E is a major 3rd interval 2 whole steps. From E to G is a minor 3rd interval 1 and a half steps. Remember that any major chord has a major 3rd interval between the root note and the 3rd note of the chord. Another way to remember what note is on the 5th note is that the distance from the 1st to the 5th note is a perfect 5th interval. From C to G is a perfect 5th. A MINOR CHORD has a MINOR 3RD INTERVAL from the root to the 3rd note. The 3rd note has been flattened or lowered a half step. 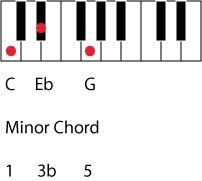 A MINOR CHORD always has two intervals-A MINOR 3RD FROM THE ROOT and then a MAJOR 3RD from the 3rd to the 5th. From C to Eb is a minor 3rd interval. From Eb to G is a major 3rd interval. The C minor chord has C, Eb, and G. The minor chord is 1, b3, and 5. When you flattened the E to Eb you change the interval from major to minor from C to Eb. Then the interval from E to G changes to Eb to G a distance of two whole steps, and is a major interval from Eb to G.
The minor chord reverses the order of the intervals from major 3rd from the root and minor 3rd from the 3rd to minor 3rd from the root and major 3rd from the 3rd. It then becomes a minor third from the root and a major 3rd from the 3rd to the 5th. Remember a major chord has a major 3rd interval from the root note. The minor chord has a minor 3rd interval from the root note. They both have a perfect 5th from the root to the 5th. The 5th note is not flattened. Remember a major third interval has two whole steps. A minor 3rd interval has one and a half steps. A DIMINISHED CHORD is two minor thirds. The diminished chord is 1, b3, and b5. 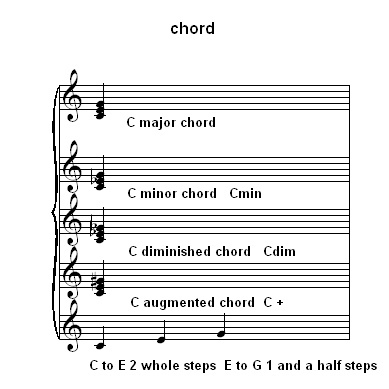 The C diminished chord is C, Eb, and Gb. AN AUGMENTED CHORD is two major thirds. The augmented chord is 1, 3, and #5. The C augmented chord is C, E, and G#.